Anton Lesser as Thomas More in the BBC dramatisation of Hilary Mantel’s Wolf Hall. Pic courtesy BBC. Two catholic bishops in England and Wales as well as a professor of the history at Cambridge have expressed concern over the anti-Catholic depiction of St Thomas More in the BBC series Wolf Hall. 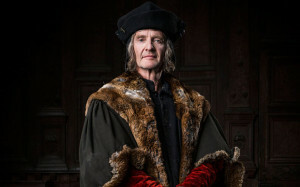 According to the Catholic Herald, Bishop Mark Davies of Shrewsbury said of the television dramatisation of Hilary Mantel’s novel, that “one of the greatest Englishmen” has been presented in it as “a scheming villain”. St Thomas More was canonised in 1935 and made a patron saint of politicians by St John Paul II in 2000. Writing in The Tablet, Professor Eamon Duffy said More in Hilary Mantel’s character in the novel is “More as he was perceived by his enemies – a joyless puritan, a man whose social charm but cruel humour masked a steely religious bigotry”. Thomas Cromwell, who helped to send St Thomas More to his death is in contrast portrayed as “a deeply human, enlightened and modern man who cuddles kittens”. Bishop Davies said it should be remembered that Wolf Hall is a work of fiction. “It is an extraordinary and perverse achievement of Hilary Mantel and BBC Drama to make of Thomas Cromwell a flawed hero and of St Thomas More, one of the greatest Englishmen, a scheming villain,” he criticised. Separately, Bishop Mark O’Toole of Plymouth said there was a “strong anti-Catholic thread” in the series and that the drama appeared to connect St Thomas and his Catholic faith to religious fundamentalism in the 21st century. “Those modern parallels need to be cautiously drawn,” said Bishop O’Toole. “Hilary Mantel does have this view that being a Catholic is destructive to your humanity. It is not historically accurate and it is not accurate in what the Catholic faith has to contribute to society and to the common good as a whole. In the BBC drama it is Cromwell who is seen educating his daughters while Thomas More is depicted as humourless, severe and unloving. According to the Bishop of Plymouth it was Margaret, St Thomas’s eldest daughter, who learned Latin and Greek in the home “which was very uncommon”. “Did More make mistakes? Yes. Does it mean he is not a saint? No. Mainstream histories seem to recognise that. Wolf Hall is not presenting Thomas Cromwell through a neutral perspective. There is an anti-Catholic element, Bishop O’Toole told the Catholic Herald. Bishop O’Toole has had a life-long devotion to St Thomas, attending St Thomas More Catholic High School in North London, and studying at and then serving as rector of Allen Hall, the seminary built on part of the site of St Thomas’s Chelsea home. One of his first acts when he was ordained Bishop of Plymouth last year was to visit Buckfast Abbey, Devon, and pray before the saint’s hair shirt, which is kept by the Benedictine monks there. According to Professor Duffy in The Tablet, much of the historic criticism of St Thomas focuses on his alleged involvement in the pursuit and prosecution of heretics during the reign of Henry VIII. “English law at the time dictated that those who refused to abjure their heresy were burned at the stake,” he explained. He resigned his office when Henry took the English Church into schism from Rome, annulled his marriage to Katherine of Aragon and wedded his mistress, Ann Boleyn, whom he hoped would bear him a son. Cromwell then summoned St Thomas to Lambeth Palace to take the oath attached to the Act of Succession, which recognised the progeny of the King and his new Queen to be the legitimate heirs to the throne. St Thomas refused on grounds of conscience to take the oath and was committed to the Tower of London. He was beheaded on Tower Hill on 6 July 1535 after he was convicted of treason in a trial at Westminster Hall.